DreamWorks has become a household name in the realm of family-friendly animated movies. Though the company is not as old as Disney, by now some of its films have become just as widely known. Shrek, Kung Fu Panda, Madagascar and How to Train Your Dragon are just a few of their flagship franchises. These movies told stories that captured the hearts of audiences all over the world. Characters from DreamWorks movies like Shrek and Po and Hiccup and the Central Park Zoo escapees are some of the most beloved animated characters today. However, as popular as DreamWorks’ movies and characters are, some fans are just never satisfied with what the movies show. We can still love the movies while wanting to see our own versions of the story and the characters. This could be an alternate version of the story, or entire different situations that the characters find themselves in. Or it could be a drastically different artistic interpretation that appeals more to certain fans. This is where fan art comes in. In this modern digital age, fans will make redesigns of absolutely anything. Sometimes fan art done for a movie and its characters is so inspired, so endearing, or so impressive that it’s even better than what the film has to offer. After all, fans with artistic skills can shape an image of exactly what they want to see. If you ever wanted to see even better versions of your favorite DreamWorks movies, we’ve got you covered. Here are 20 DreamWorks Fan Redesigns Better Than The Movies! In the How to Train Your Dragon movies, Vikings and dragons had been enemies for thousands of years. Until one misfit Viking boy named Hiccup met an unusual dragon named Toothless. The two of them built a greater understanding between Vikings and dragons. 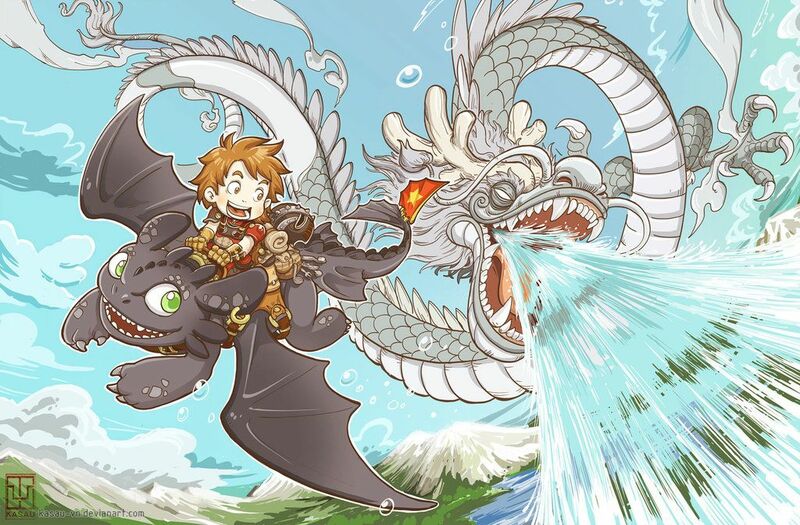 After that, Hiccup and Toothless went on many high flying adventures. While the two of them became more capable in How to Train Your Dragon 2, artist Tantaku has brought them to a whole new level. In this striking pose, Hiccup has two flaming swords brandished. And Toothless is showing many more teeth than usual. Both of them are glaring with fury as they stare down some opponent out of frame, ready to launch into battle. Danny Phantom was a Nickelodeon animated teen superhero show that ran from 2004 to 2007. The titular hero gained the powers of a ghost when he set foot in the Ghost Portal in his parents’ lab. His DNA became fused with ectoplasm. With his new found powers, he decided to protect his neighborhood of Amity Park from more malevolent ghost. Only a fan artist like secretsivekept could imagine a crossover between Trolls and Danny Phantom. 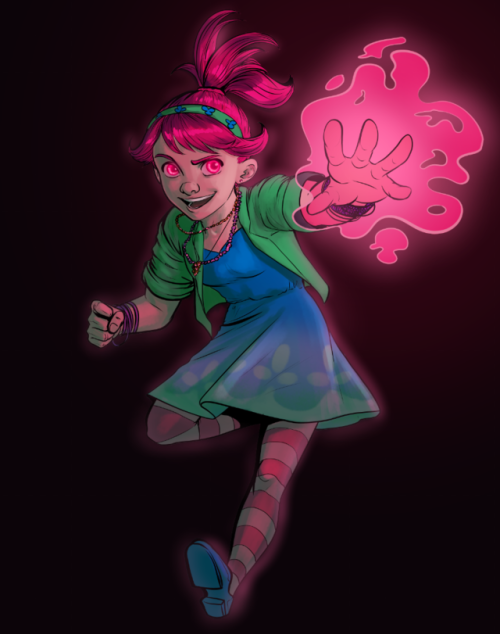 Poppy is reimagined in Danny’s role, with his ghost powers and his signature catchphrase. 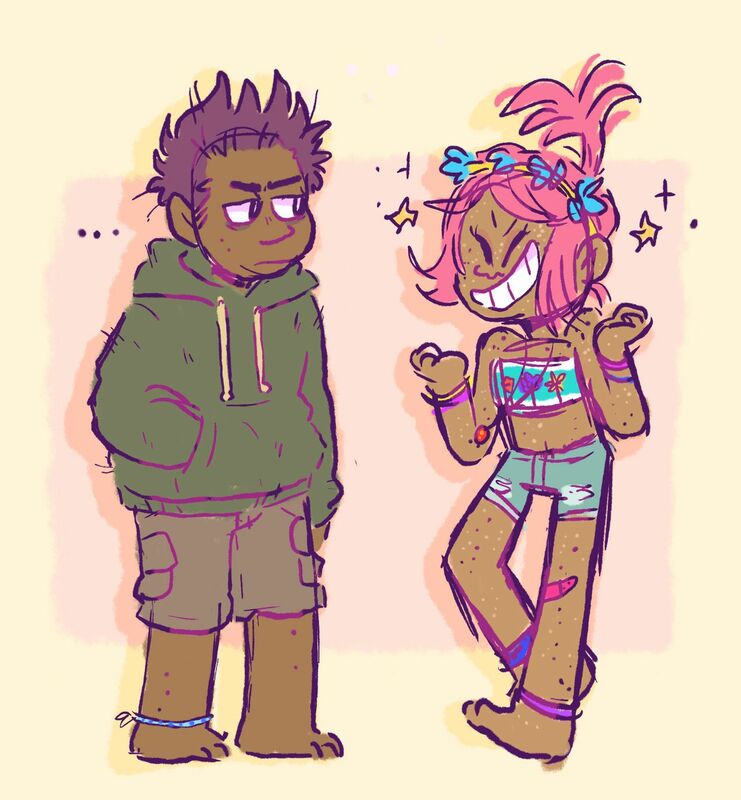 Poppy/Danny is brought up to regular teenager size, but her colorful attire, hair, and skin are all still accounted for. The ominous shadows around Poppy really make her stand out. Shrek is meant to be a more mature parody of classic fairy tales and family friendly sensibilities we associate with them. Shrek, the hero, is an ogre and his faithful companion is a donkey. The princess Fiona turns out to be an ogre too and is not afraid to get her hands dirty. The Shrek movies poke fun at conventional tropes. One Disney movie that Shrek never extensively borrowed from was Aladdin. However, if you ever wanted to see Shrek and Fiona in the molds of Aladdin and Jasmine, YoshiHorse has you covered. 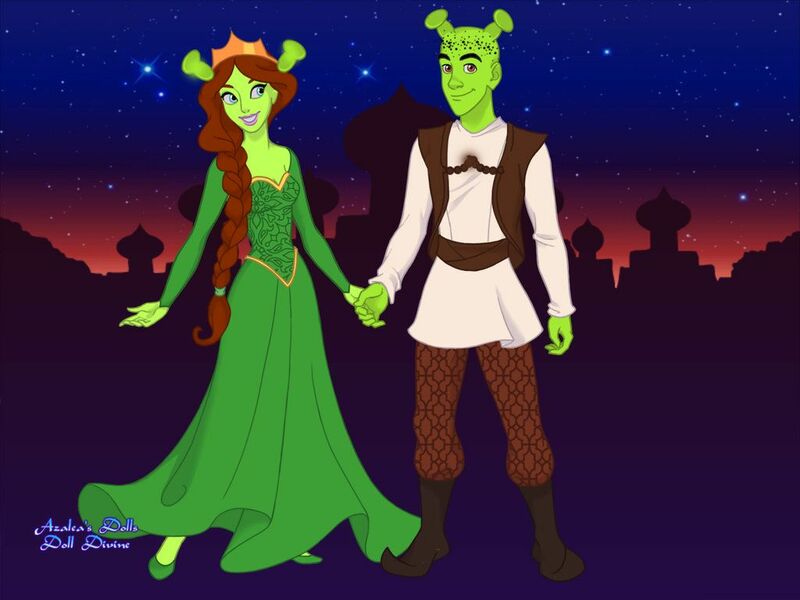 This interpretation is much closer to the conventional modern fairy tale style – especially in the figures for Shrek and Fiona. In this DreamWorks movie, the titular Croods are a family of prehistoric cave dwellers. They stick to what they know and lead simple lives. However, one of them is not satisfied with their life. Eep, who is voiced by Emma Stone, wants to find out more about the world. She eventually meets Guy, who is voiced by Ryan Reynolds. Guy and his sloth Belt warn Eep and the Croods that dangerous new experiences are in store for them. It’s hard to say if prehistoric Japanese art styles would have been close to modern anime art styles. 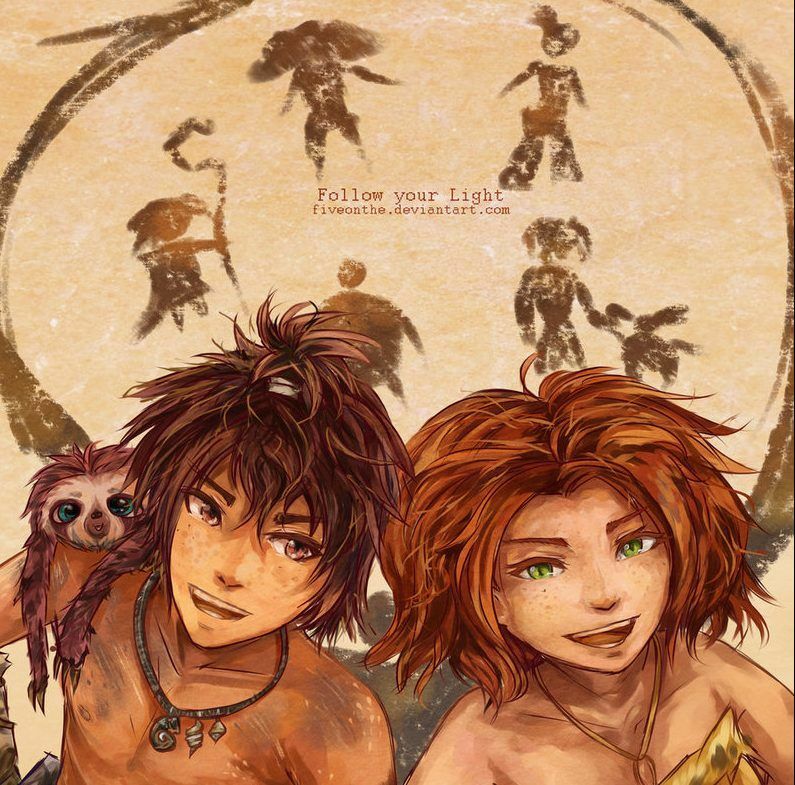 However, artist Fiveonthe has drawn a delightful version of the Croods nonetheless. The detail in their hair and faces is very impressive and they still have their caveman drawings behind them. Dragons appear in many different cultural mythologies. The dragons in How to Train Your Dragon may have decidedly more western inspirations, but what if there were broader cultural inspirations for the film in the design of the human and dragon characters? What if the movie included a traditional Asian dragon? Artist kasau-vn has a gorgeous tableau of what this might look like. 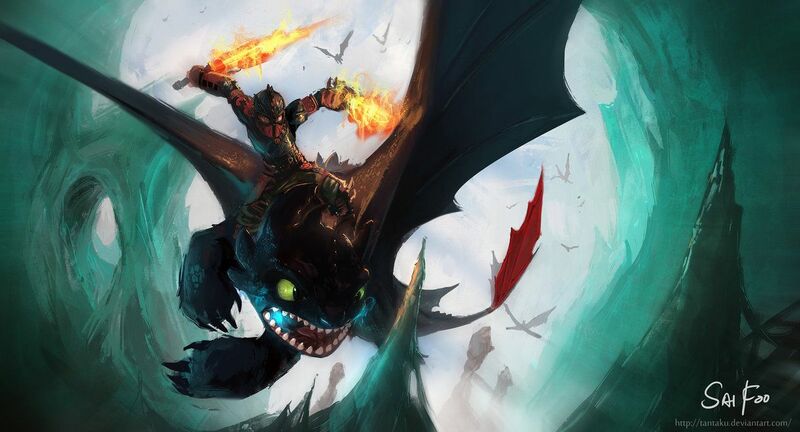 Hiccup and Toothless are soaring through the sky, with somewhat exaggerated sized heads. They’re looking behind them at a colossal white Chinese dragon. It’s spiraling through the air, beards and tail trailing behind it and shooting water from its mouth. Also, to signify the different cultural influence, Toothless’s prosthetic tail wing has a red and gold flag on it. DreamWorks took this toy fad for little trolls with colorful hair and developed them into an animated feature movie. It was a familiar family-friendly musical fare, but it did have a lot of memorable songs and two star voice acting performances from Anna Kendrick and Justine Timberlake. Kendrick plays Princess Poppy, the preppy protagonist who has to save her kingdom from the Troll-Devouring bergens. Timberlake plays Branch, a sullen troll who has lost his color. Squigglegigs has blown the trolls up to relative human size. Poppy and Branch’s colors and personalities are still consistent; she is bright blue and pink while Branch is subdued and gray. 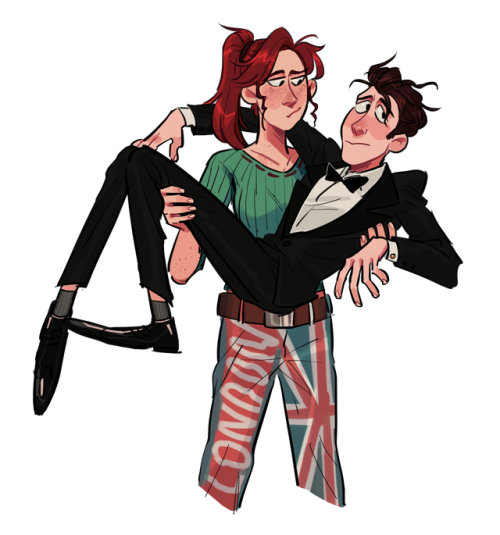 Branch also looks like he can barely stand Poppy’s relentlessly happy attitude. Giant Pandas doing kung fu may not be as new as some fans think. In the Warcraft games, the Pandaren were introduced originally as an April Fool’s joke in the Warcraft 3 expansion The Frozen Throne in 2003. Then, in 2012, they got their own World of Warcraft expansion based on their race and realm called Mists of Pandaria. The first Kung Fu Panda movie was released in 2008. Whether any one at DreamWorks was aware of or played Warcraft 3 The Frozen Throne, we may never know. However, artist devination has gone ahead and merged the two franchises regardless. 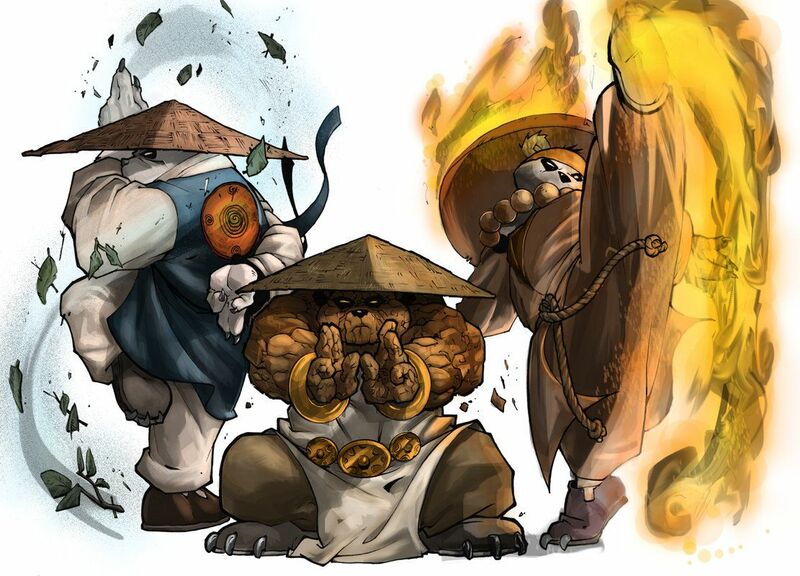 These three Kung Fu Pandaren are each striking disciplined poses while channeling earth, wind, and fire. Who would have ever thought of a concept like a racing movie with talking snails? In DreamWorks Turbo, Ryan Reynolds plays Theo or Turbo, an ordinary garden snail who dreams of becoming the fastest racer in the world. Through a fantastic wish and some accidents, he gets the chance to prove himself and compete in the Indianapolis 500 race. 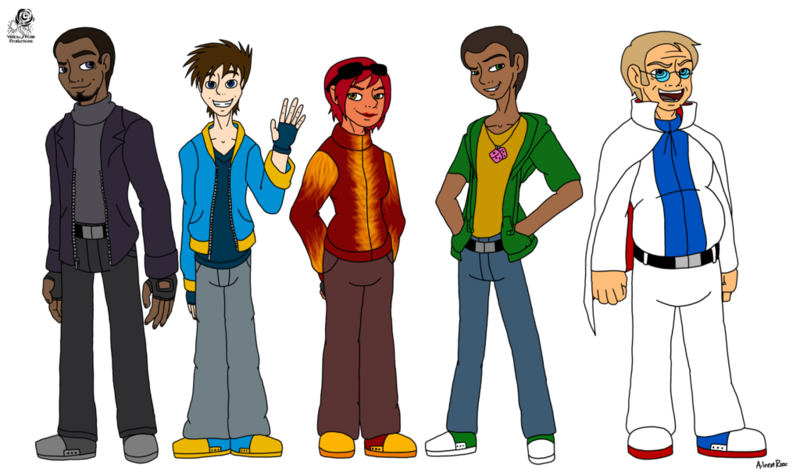 While most of the cast are snails, Aileen-Rose has illustrated some of the main characters as regular human characters. From left to right we have Whiplash, Skidmark, Burn, Smoove Move and White Shadow. Their designs take a bit more direct inspiration from their human voice actors. The level of detail is still consistent. 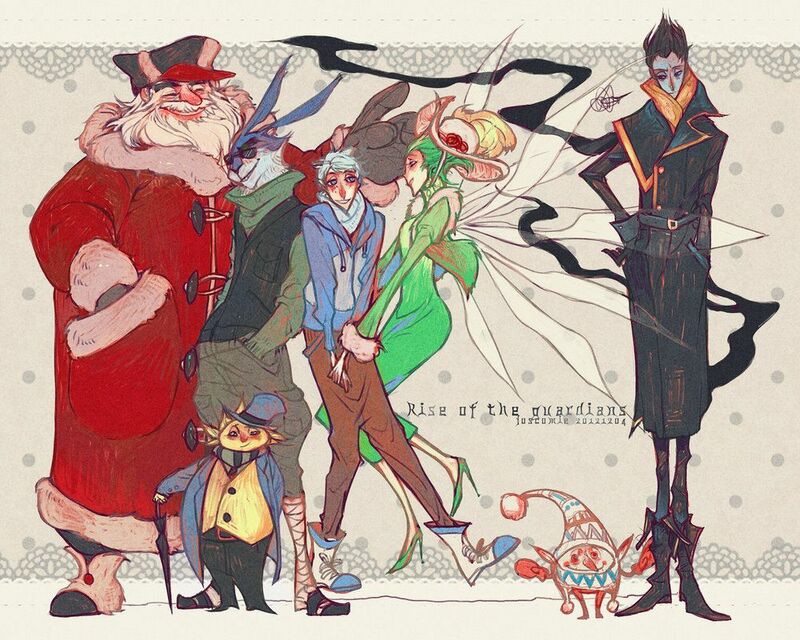 In DreamWorks Rise of the Guardians, various characters from myths and folklore protect children from Pitch, the Boogeyman. The Guardians include St. Nicholas, The Sandman, The Easter Bunny, and the Tooth Fairy. 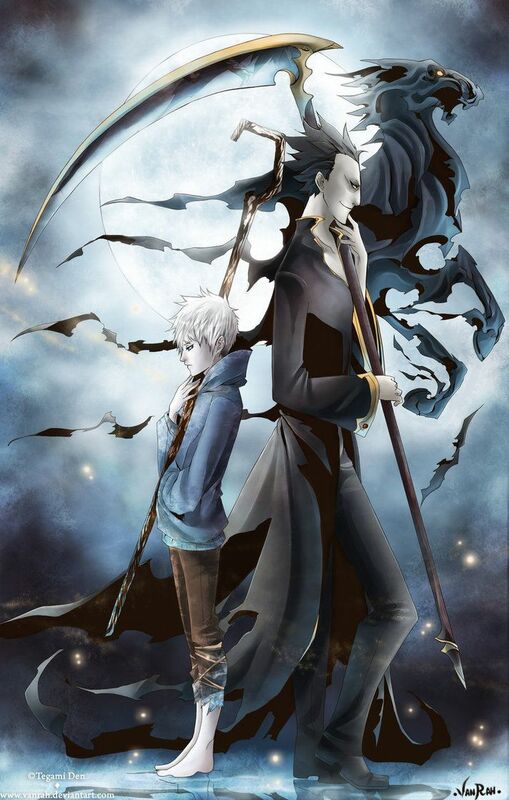 Jack Frost is a more recently created mythic figure. At first he’s reluctant to officially join the Guardians, but he comes to appreciate their comradery and the need to stop Pitch. Since the Guardians are all based on characters from folklore, it’s appropriate to imagine them in more antiquated styles. Artist Wavesheep has brought the Guardians to life in a turn of the century sensibility. North, Sandy, and Pitch are all in button up coats, while Tooth has a fabulous hat and fur trimming. 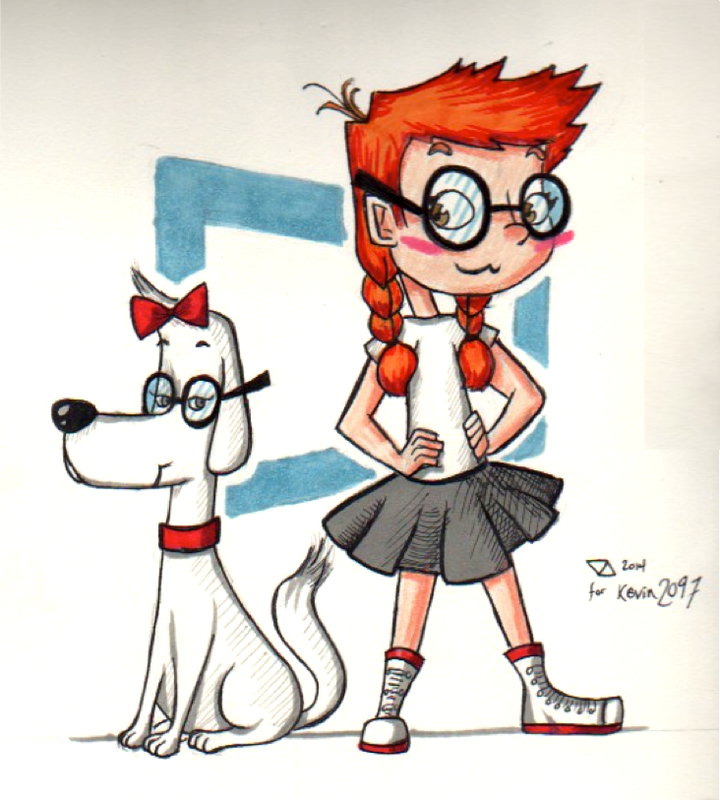 In this piece, artist Blerep has imagined a scene that didn’t exist in DreamWorks Mr. Peabody and Sherman. 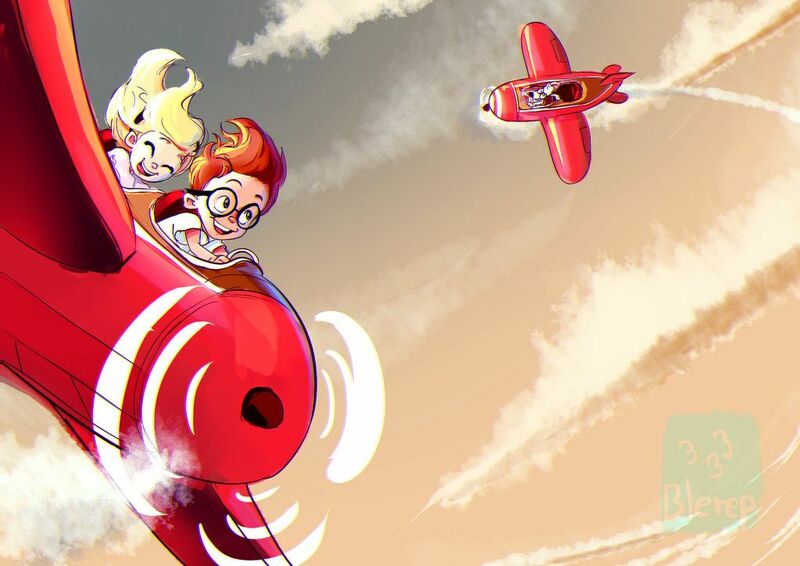 In the film, Peabody and Sherman both fly in the WABAC machine, and Sherman gets a chance to fly Leonardo da Vinci’s flying machine – until it crashes. However, they don’t get the chance to fly their own, fully functional planes. Sherman is in the cockpit of his own plane, while Penny is in the seat behind. Peabody is in the background trailing around Sherman. The art style looks like a hybrid between the flat 2D animation of the original Mr. Peabody and Sherman shorts and the 3D movie animation. There’s a definite sense of depth of field and perspective. In Dreamworks’ Megamind, the titular supervillain turns from evil to good. After finally besting his superhero arch nemesis Metroman, Megamind realizes that his villainy has no purpose any more. However, the super being he creates to fill that role ends up being a greater threat to the city, so Megamind has to become a good guy to stop him. He doesn’t lose his sense of style or intellect when he transforms from an evil mastermind to a good guy. Over the course of the mobir, Megamind falls for reporter Roxanne Ritchi. They admit their feelings for each other by the end of the film, but we never get to see them afterwards. Artist Demyrie has some ideas. 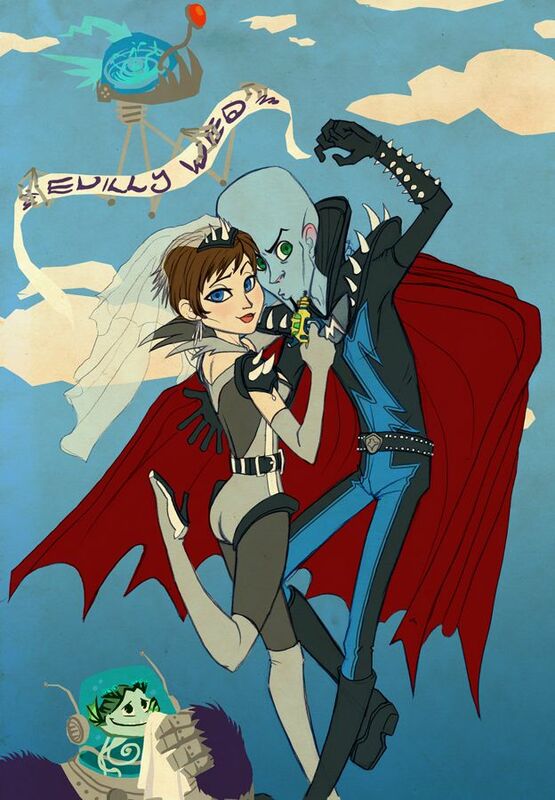 In this image, Megamind and Roxie have a villain themed wedding complete with supervillain garb for both of them and even an “Evilly Wed” marquis. In the first Madagascar movie from DreamWorks, Alex the lion, Marty the Zebra, Melman the Giraffe, and Gloria the Hippo all escape to the titular island. In the second movie, the four friends try to make it back to New York but crash land again on the mainland of Africa. 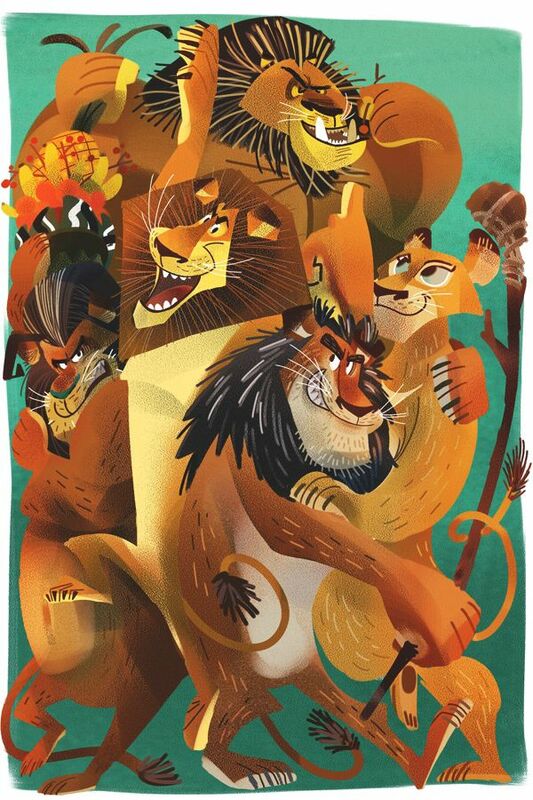 Alex happens to reunite with his family, a wild pride of lions. While his return causes tension among the pride in the movie, in this stylized poster from artist galgard, Alex and the pride all seem to be having fun – at least Alex and his mother and father look like they are having fun. Magunta and Teetse are getting squashed or shoved down to the side and bottom. This is the typical arrangement for a family friendly movie poster. The limited perspective with brown and gold colors really sets it apart. Jack and Pitch have a lot in common in Rise of the Guardians. They have both led solitary lives and they both want to be believed in. Pitch tries to play on Jack’s fears of not being welcomed by the Guardians. They confront each other one-on-one in the second act of the movie, and Pitch tricks Jack into giving up his staff. Fans have definitely appreciated the connection that the movie makes between these two characters. In this piece by artist VanRah, Jack and Pitch stand back to back in a misty moonscape. The juxtaposition is striking. Both stare into the distance with their staffs over their shoulders, but Pitch looks out ahead with a sinister smile. Jack stares at the floor with sad frown. In DreamWork’s Home, the alien Boov invades Earth, but they just end up separating the humans into isolated areas. Gratuity Tucci or Tip wants to find her mother again. She reluctantly teams up with a Boov fugitive named Oh to reunite with her family and hopefully stop the scary Gorg from destroying Earth too. 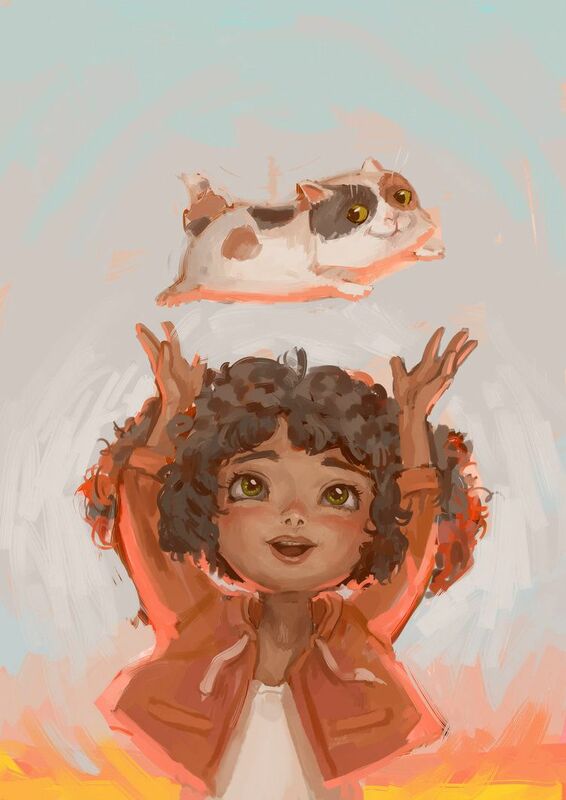 Tip has a large calico cat named Pig that tags along for their adventures. Pig takes a liking to Oh, much to his bewilderment. Artist Mireys has illustrated this touching moment between Tip and Pig. Pig looks perfectly happy to be thrown through the air, and presumably caught again. This version of Tip seems a little younger than her movie character. The facial details and untied hair give that impression. Flushed Away was produced by DreamWorks and Aardman Animations, so you can expect plenty of British characters and humor. The story follows Roddy, a pet rat of an upper class Londoner. He gets flushed down the toilet to a whole different, grimier world of rats, called Ratropolis. He soon meets Rita, a street smart rat from a big family who is also the captain of her own ship, the Jammy Dodger. Despite being rats, the main characters of Flushed Away are pretty close to human in appearance. However, they do have the Aardman signature eyes and mouth. In ffc1cb’s interpretation of the characters. Roddy and Rita are fully human. Roddy looks like he’s just arrived in Ratropolis, as he’s sopping wet. Rita is holding him in her arms with a pitying frown. Hiccup is not a typical Viking teenager. He wants to fit in with the rest of his tribe and become a great dragon slayer. However, when the moment comes to take down a captive Night Fury dragon that he’s shot down, he can’t bring himself to do it. Instead, he figures out a way to peacefully subdue dragons without claiming their lives. This makes Astrid, his fellow trainee, very suspicious. It doesn’t help that Hiccup has a huge crush on Astrid. 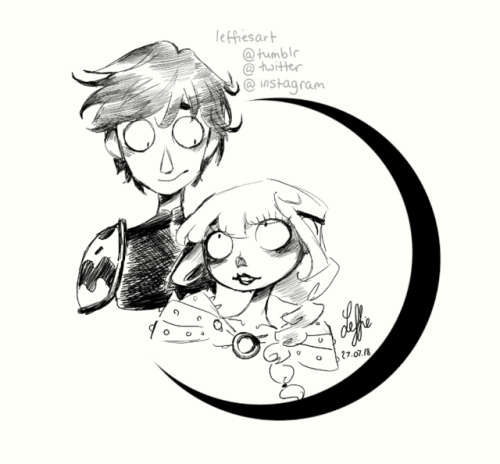 In leffiesart’s interpretation of Hiccup and Astrid, the two appear in a very distinct and very different style. The black and white style with round faces and big eyes looks like it came from one of Tim Burton movies, such as The Nightmare Before Christmas. The Chinese inspired world of Kung Fu Panda is bright and colorful with many diverse anthropomorphic characters. Many of them start out being proficient in kung fu, except for Po. Po is gluttonous and prone to accidents. However, he does get the chance to train in real martial arts when Grand Master Oogway picks him as the prophesized Dragon Warrior. 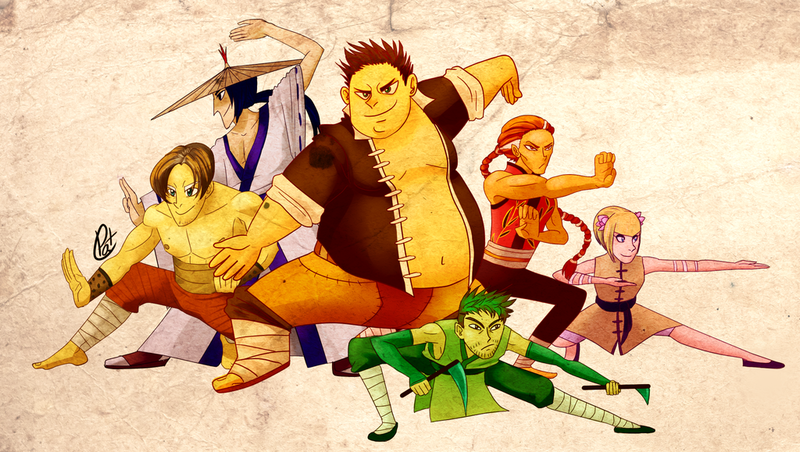 Artist miaokep has reversed the aesthetic of the Kung Fu Panda franchise by making the characters purely human. In this interpretation, they look even more like their human voice actors. Po stands large front as center. Crane, Monkey, Viper, Tigress and Mantis are all striking poses appropriate to their characters and animal incarnations. 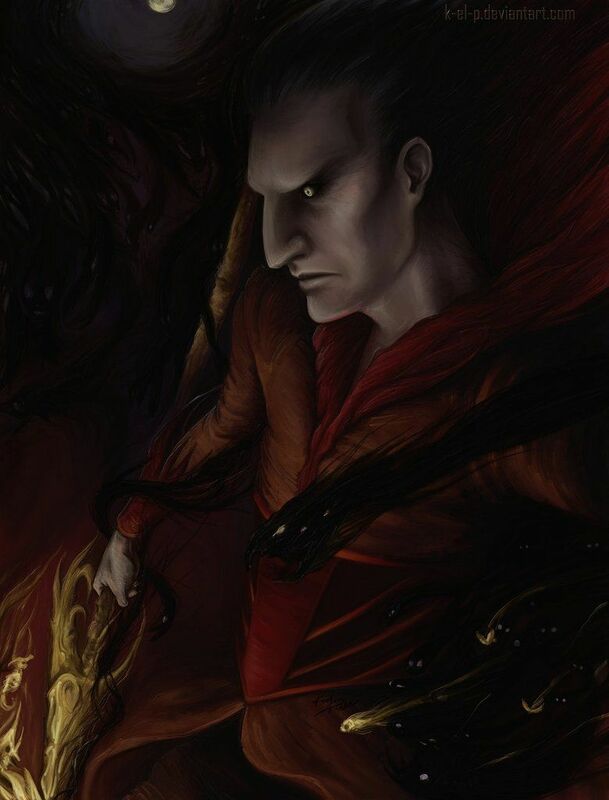 The illustration even appears on a scroll, like the Dragon Scroll in the movie. In 1726, Irish clergyman and satirist Jonathan Swift published Gulliver’s Travels. In the first story in Gulliver’s Travels, Lemuel Gulliver washes ashore on Lilliput island from a shipwreck and wakes to find that he’s become the prisoner of a race of tiny people barely six inches high. This part became the most famous and referenced from the whole book. 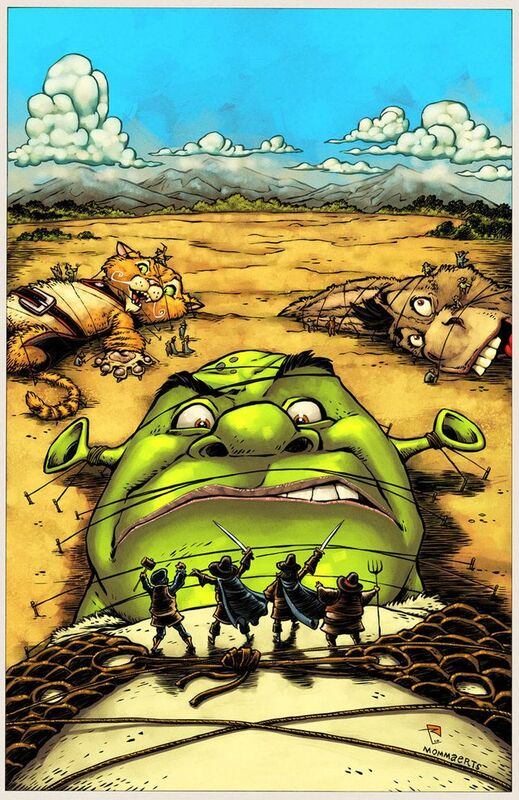 It’s kind of amazing that Shrek of all franchises hasn’t parodied it officially. However, that’s just what this fan redesign does. The black and white ink version is by artist robbvision and the color version is by artist rolomallada. The level of detail is incredible, especially the exaggerate perspective of Shrek straining to see his tiny captors. Just as there are light and soft inspirations for folktales, there are also darker interpretations. The Boogeyman was made to frighten children and he can take any number of forms. His appearance in Rise of the Guardians is dark and spectral, but not horrific. This interpretation by artist K-EL-P is much more ominous. This style is much more gothic than the character who appeared in the family-friendly animation by DreamWorks. Here, Pitch’s eyes are beadier and his spectral tendrils are rougher and spikier. The lighting in the piece can make the details hard to see unless you look closely. However, this plays into Pitch’s whole shtick for shadows. You can’t tell what forms the monsters with the glowing eyes will take. This is the stuff of nightmares. Mr. Peabody and Sherman are characters that originally appeared in their own vignettes on the Rocky and Bullwinkle Show. In 2014, DreamWorks developed the side characters into a feature animated film. They expanded on Mr. Peabody’s fantastic time traveling adventures with Sherman and made their relationship a bit more nurturing. Penny Peterson debuted as a new character to rival and later befriend Sherman. In verokittycat3’s interpretation, we have Miss Peabody and Sherrie. It’s interesting to imagine a mother/daughter relationship between the two characters, where they are just as knowledgeable and productive. Miss Peabody’s sense of style and poise seems even more pronounced and Sherrie seems just as eager to learn. They even still have similar glasses. What do you think of these DreamWorks fan redesigns? Are there any that you’d like to see on the big screen? Let us know in the comments!